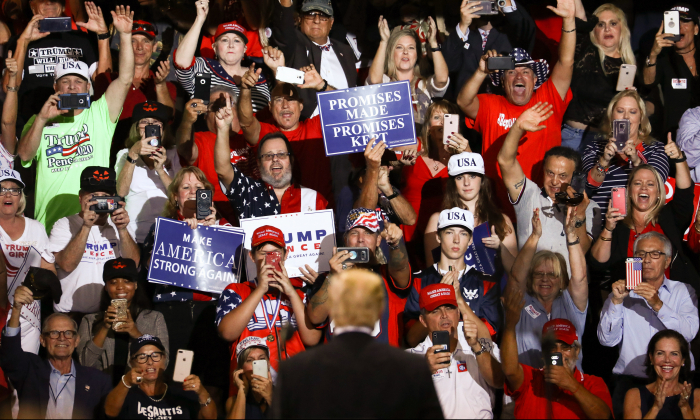 By a greater margin than that recorded in 2016, Democrats are more outspoken than Republicans and unaffiliated voters in 2018 about how they intend to vote in the 2018 congressional election, suggesting the possibility of another Election Day red wave driven by the so-called “silent majority,” according to a Nov. 2 poll by Rasmussen Reports. In 2018, 60 percent of Democrats said they were more likely to tell others about how they intend to vote, compared to 49 percent Republicans. The 11-point gap is nearly double that recorded in 2016 when 52 percent of Democrats and 46 percent of Republicans said they were more likely to inform others of their voting intentions. “Some analysts before and after Donald Trump’s upset victory suggested that most pollsters missed his hidden support among voters fearful of criticism who were unwilling to say where they stood,” Rasmussen stated in a press release. The gap between Democrats and unaffiliated voters in terms of outspokenness has increased from 18 points in 2016 to 20 points in 2018. Rasmussen was the most accurate poll in predicting the 2016 presidential election results. Unlike other polls, Rasmussen’s respondents press a button on their phones to respond to questions instead of saying their choices out loud. The difference is specifically pertinent to voters who are unwilling to voice where they stand. Overall, all groups were more likely to tell others about their voting intentions in 2018 compared to 2016. The number of outspoken Democrats went up by the greatest amount from 52 percent in 2016 to 60 percent this year. Rasmussen’s generic ballot, released on Oct. 31, put Democrats three points ahead of Republicans, with a 2 point margin of error. Forty-seven percent of likely U.S. voters would pick a Democrat and 44 percent would pick a Republican if the midterm election were to take place when the poll was conducted. Rasmussen will publish its final reading on the day before the Nov. 6 midterm election. “Seventy-seven percent of Republicans say they always vote in midterm elections, compared to 71 percent of Democrats and 63 percent of unaffiliated voters. The real story on Tuesday will be which side turns out even more than usual,” Rasmussen stated. President Richard Nixon coined the term “great silent majority” in a 1969 speech. The term is generally understood as a large group of people who do not express their opinions publicly.